Description: To clean, surface finish & debur metal surfaces. Tapered center hole to fit polishing motor spindle. India. Description: To clean & polish to brighter finish. Tapered center hole to fit polishing motor spindle. India. Description: 9/32” long oblong mounting holes make these multi-use handles. 2-5/8” & 3-1/2” overall length. Each has a set screw for easy tightening with included hex key. India. Description: Hard-to-find high speed steel tap in the most common micro size. 13/16” long. China. Description: Replacement center shaft fits the KWM bushing tool. Shaft has the recess slot of the snap ring and long vertical slot just like the original.39" (10mm) OD x 7" (180mm) long. Description: 8.5mm (approx .334”) x 11-1/2”. #0 grade. Made in France. Regularly $2.00/each. While supplies last. Description: Hard to find nickeled tool. 3-3/4” long with knurled handle. Adjustable end tong for gripping with a sliding mechanism to lock. Regularly $20.00/each. While supplies last. Description: Wool on wood sticks. Use to polish. 12mm square x 100mm long (#7/16" x 4"). India. Description: Press pump. 2” square plastic body with metal cap. 4-3/8” tall. 150 ml capacity. India. Description: 6" long brass. Black head & extra chuck. 1.0mm Max. capacity. India. Description: French type collet pin vise. Plastic handle. 4” long. 1.0mm max capacity. India. Description: 4-1/2” stainless. India. Special buy. Regularly $3.00/each. While supplies last. Description: 5” general purpose stainless tweezers. India. Special buy. Regularly $3.00/each. While supplies last. Description: 2-piece magnetic aluminum replacement jaw set. 1" x 3" rubber faces. China. 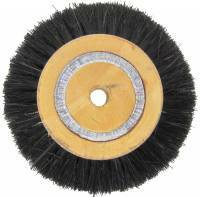 Description: Handy plastic mini brush with nylon bristles to clean delicate or small areas. 2-7/8" long. India. Description: Good quality. Polished head. Serrated jaws. PVC handles. 1/16” tips for fine work. Spain. Special buy. Regularly $10.00/each. While supplies last. Description: Good quality. Polished head. PVC handles. 1/16” tips for fine work. Spain. Special buy. Regularly $10.00/each. While supplies last. Description: Holds small parts at any angle. 2-1/8” plastic base is 3/8” thick. 9” long x 1/4” diameter rubber coated wire can be positioned as desired. Alligator clip has 1/2” long jaws with a 3/8” opening. With mounting tape. Description: Nickeled fixed flat blade screwdriver with knurled body. India. Special buy. Regularly $1.00/each. While supplies last. Description: Handy for hobbyists. 7” long with one nylon and one metal head. Rubberized handle. Weighs 60 grams. India. Description: 4-1/4’' stainless steel. Special buy. Regularly $4.00/each. While supplies last. Description: 4-3/4” stainless steel. Special buy. Regularly $4.50/each. While supplies last. Description: 6-3/4” stainless steel. Plain pointed tip. India. Special buy. Regularly $5.00/each. While supplies last. Description: French stainless 5-3/4” lap joint pliers. Special buy. Regularly $22.00/each. While supplies last. Description: 4-7/8” serrated jaw pliers. Rubberized grips. Spain. Special buy. Regularly $7.50/each. While supplies last. Description: New stock. Difficult to find French made quality tool. Used by watchmakers & jewelers to draw temper from balance staffs without discoloring the wheel. Special buy. Regularly $35.00/each. While supplies last. Description: Italian made. Hand file in round profile. 5-1/2” long. Special buy. While supplies last. Regularly $3.00/each. Description: Italian made. Hand file in triangular profile. 5-1/2” long. Special buy. While supplies last. Regularly $3.00/each. Description: Good quality, general purpose, Master brand screwdriver. 13” long overall. 8” long blade. Flat blade tip measures .044” thick x .305” wide. Special buy. Regularly $6.50/each. While supplies last. Description: Italian made. Hand file in round profiles. 5-1/2” long. Special buy. While supplies last. Regularly $3.00/each. 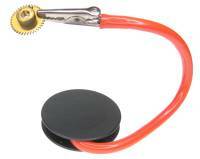 Description: Used by clock & watch repairers for drilling the finest holes. With a right hand 0 degree rake angle. 0.23mm diameter x 0.6mm shank diameter. Swiss. Special buy. Regularly $12.50/pack. While supplies last. Description: Used by clock & watch repairers for drilling the finest holes. With a right hand 0 degree rake angle. 0.33mm diameter x 0.6mm shank diameter. Swiss. Special buy. Regularly $12.50/pack. While supplies last. 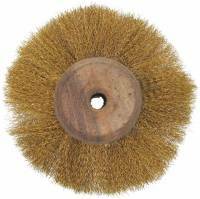 Description: Used by clock & watch repairers for drilling the finest holes. With a right hand 0 degree rake angle. 0.34mm diameter x 0.6mm shank diameter. Swiss. Special buy. Regularly $12.50/pack. While supplies last. Description: Used by clock & watch repairers for drilling the finest holes. With a right hand 0 degree rake angle. 0.35mm diameter x 0.6mm shank diameter. Swiss. Special buy. Regularly $12.50/pack. While supplies last. Description: Stainless steel. Knurled handle. Can use for other purposes. Special buy. India. While supplies last. Regularly $2.50-$3.50.